The 12th race event for the 2010 IZOD IndyCar Series season would be the second to last event on a road course. Collecting just outside of the two of Lexington, Ohio for the Honda Indy 200 on the scenically-located Mid-Ohio Sports Car Course, a 27-car contingent prepared for 85 laps around the 2.258 permanent circuit. Winning all but one of the open wheel tour's races held on street or permanent road course this season prior to Edmonton, the Penske Racing team had been retaining a competitive edge on their rivals which has been led by Target/Chip Ganassi Racing. However, through the infamous actions of Penske Racing driver Helio Castroneves for blocking teammate Will Power on a late restart during the Honda Indy Edmonton, the #9 Target car of Scott Dixon broke through their first road course win of the year. Showing weakness in Edmonton, the Penske bunch headed for Mid-Ohio determined to prove their on-track blooper was a fluke. Storming to pole, the #12 Verizon Penske car driven by Will Power outran Target/Chip Ganassi Racing's Dario Franchitti through Saturday Firestone Fast Six qualifying. Power would lead the first 22 laps of the Honda Indy 200 event under green until a yellow flag was thrown. The caution resulted from a coming together of Justin Wilson's #22 car and the #8 of EJ Viso in lap 4. Race-ending contact for both race team cars, each driver accused the other of not showing room during the early 1/3 distance. As competitors were nearing their initial stops for fuel and tires, the caution was well-placed. While Power and the other front-runners pitted on that cue, one car presently deep in the field scored a major advantage with the timing of the yellow. Short-pitting from 15th place on lap 22, Alex Tagliani brought his #77 race to the attention of FAZZT Race Team mechanics in a team strategy that allowed them past some strong open wheel cars on a circuit notoriously hard find passing opportunities. In virtue of making a pit stop under green three laps earlier, the #77 FAZZT Race Team Indy car was vaulted right up to the race lead. Stung by back-to-back retirements due to contact in Toronto and Edmonton, the FAZZT Race Team returned to the United States without a desirable result in front what the team considers their home country. Losing the opportunity for top-10 race runs due to conduct of other drivers, Alex Tagliani was most vocal following through post-race interviews after the Honda Indy Toronto. Prepared to move on at Mid-Ohio, a confident Tagliani commented after Saturday qualifying. "Let's be frank, we have had our share of problems lately on road course, but the radical changes to our suspension packages improved the car". The Lachenaie, Quebec native would lead the most laps of any individual driver during the Honda Indy 200 at Mid-Ohio. Completing 30 circuits in the top position between lap 26 until lap 56, Tagliani and the #77 FAZZT Race Team would secure a season-best 4th place result. Charging from 14th to just outside of the podium, Tagliani said "It felt good (to lead laps). It is very difficult when you're in the back. This track is so difficult to pass on, so I'm very pleased that the strategy worked out". Alex Tagliani credited his chief engineer Rob Edwards as well as the other FAZZT Race Team engineering team for setting up the #77 car. Tagliani's stint out in front of the IZOD IndyCar event was not accompanied by the 25 laps of green flag running Will Power had enjoy in the prior run. With the race field showing more haste, two cautions flew between the lap 28 restart and lap 37. The earlier yellow flag was thrown regrettably for the #5 KV Racing Technology car of Tukuma Sato. Posting a season-best 3rd place qualifying effort, Sato showed again in his rookie IZOD IndyCar Series season the pace to be competitive through the early stage of the Mid-Ohio race. However, on lap 28, Tukuma Sato potentially breakout race weekend ended when the Japanese driver lost grip on a dirty patch of turn 4 resulting in damage to yet another KV Racing Technology-owned car. On lap 55, Alex Tagliani would relinquish 1st place as the lead drivers who stopped on the first yellow flag eventually gained the upper hand. 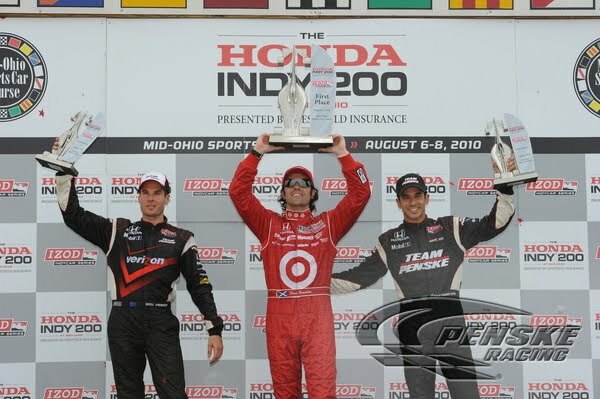 The new leader became the Target/Chip Ganassi #10 of Dario Franchitti positioned ahead of Penske Racing's Will Power. Surviving Power's charge on two restarts between lap 60-70 for on-track incidents involving IZOD IndyCar newcomer Francesco Dracone, Dario Franchitti finished 1st by 0.5234 seconds. As Power took second, third place car was his Penske Racing teammate Helio Castroneves who once again found themselves close on the timing and scoring charts. Perhaps helped by the Castroneves #3 car finishing more than 3.5 seconds behind Power's #12 machine. Alex Tagliani and the #9 Target/Chip Ganassi car of Scott Dixon finished out the top-5 finishers. Missing out on a 5th 2010 IZOD IndyCar Series victory, Will Power was able to find a good reason to celebrate with his #12 Penske Racing team. Crossing the Mid-Ohio finish line in 2nd place, the Australian locked up the top spot in the IZOD IndyCar Series' first road course racing championship. Power will be honoured with the first Mario Andretti Trophy holding an 87-point lead ahead of his Mid-Ohio rival Dario Franchitti. Also 1st and 2nd in the IZOD IndyCar Series overall points standings after 12 races in 2010, Franchitti is still well within play for a 3rd championship in 4 years being just 41 points behind the Australian Power. Providing a finale to the road racing inside the 2010 IZOD IndyCar Series schedule, the open wheel cars are venturing to California's Infineon Raceway for the next scheduled event.